One man was killed in the severe summer storm which swept across much of the Netherlands on Saturday. The man died when a tree was blown down and hit the car he was sitting in next to the Bilderberg hotel in Wolfheze near Arnhem, news agency ANP reported. Other people were injured in Amsterdam, Apeldoorn and Rotterdam, broadcaster Nos said, and there was severe disruption to public transport. Winds of up to 110 kph battered the country on Saturday afternoon, with the strongest gust – 121 kph – registered at the port of IJmuiden. Weather bureau Weeronline said the gales were the strongest recorded in the summer since official records began in 1901. 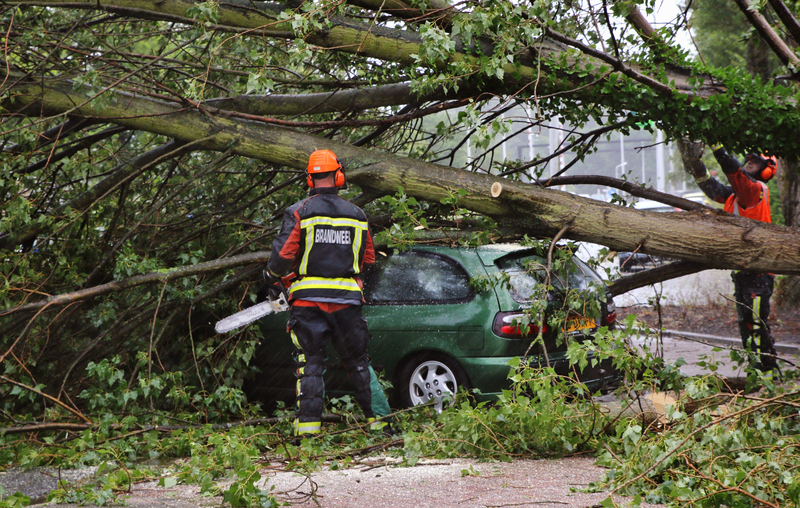 In Amsterdam, two people were injured on the Zoutkeetsplein when a tree fell on the car they were sitting in. The driver had to be freed by the emergency services. According to local broadcaster AT5, there are hundreds of reports of storm damage in the capital and tram services were cancelled for a time. In Apeldoorn a motorist was seriously injured when a tree fell on the classic car he was driving. In Rotterdam, one person was hit by a support for a market stall which was blown off, and taken to hospital. Train services to and from Amsterdam’s central station were cancelled and the area around Hollands Spoor station in The Hague was closed for a time after a crane became unstable. Trees on the line also disrupted rail services in many other parts of the country. The A4 motorway was also closed for a time. At Schiphol airport, dozens of flights were cancelled or delayed on what is a traditionally busy holiday weekend.